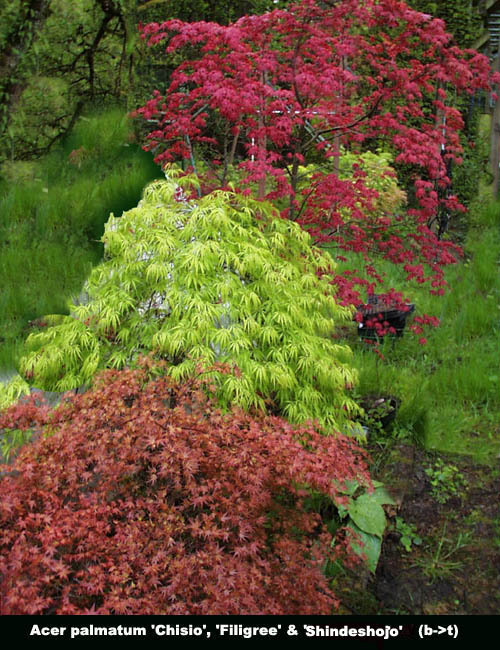 River Rock Nursery-Japanese & Vine Maple Availability, Acer palmatum, Acer circinatum. Acer japonicum. We are a retail, mail order nursery. Click our logo for many other trees & shrubs. This is our current availability list for Japanese & Vine Maples and other similar small varieties. Click on a leaf for further information on individual varieties. Sunset (Magazine) zones refer to West Coast. You can change the spacing and text size of this page using: View, Textzoom or Textsize in the upper left hand corner of the browser control. All photos and images on these web pages are copyright River Rock Nursery. No use without permission. Vertrees Japanese Maples, 3rd edition by Peter Gregory Maples for Gardens by the van Gelderens. (Either book is available from us (with a maple order) for $40.00 each or both for $75. FINAL SIZE in feet after 15 years; AVAILABLE SIZE: 1yr=1 year old plant after grafting, 2yr = two year old plant, etc. Available plant size varies with variety. NA = not currently available. std means the maple is grafted on a 'standard', a trunk about 1-2' high. This is sometimes done for weeping or clumping varieties to get them higher off the ground at first. Most of these maples can be kept to 1/2 or less of final size by minor annual pruning. For instance, we have two 25 year old vine maples in our yard. One is 12' tall and the other has been pruned to 5' tall with little effort. The same applies to Japanese Maples. Acer palmatum Japanese Maple Green leaves in summer, wonderful fall colors of yellow, bronze and/or red. Seedling grown. Acer palmatum 'Chiba' Dwarf tree used often for bonsai. Grows into a round shape. Acer palmatum 'Garnet' Weeping, dissected leave Japanese leaves--fastest growing dissected leave variety. Acer palmatum 'Goshiki kotohime' Dwarf tree with variegated leaves, white and pink, good for bonsai. Acer palmatum 'Inaba shidare' Graceful, cut leaf, dark red weeping maple, stays red all summer. Brilliant fall color. Acer palmatum 'Karasugawa' Wonderful variegated maple, pink and white leaves, pink stems, will burn unless kept in shade. Acer palmatum 'Kashima' Small leaves, grows in a round form, dwarf, used for bonsai. Acer palmatum 'Katsura' Pale yellow leaves margined in orange, change to green and then again to bright yellow and orange in fall. Acer palmatum 'Okagami' In the Mirror japanes maple leaves change from red new growth to black-red for summer and then to red and scarlet for fall. Acer palmatum 'Orange Dream' Medium sized maple to 15 feet, new growth in spring and into summer is a unique, bright orange/yellow. 'Red Filligree Lace' One of the most delicate lace-leaf maples. Slow growing and choice. Acer palmatum 'Red Wood' A selected seedling by Ed Woods. Red color said to be better on old branches than Sango Kaku. Yellow fall color. Acer palmatum 'Shaina' Compact twiggy growth and bright red foliage on this sport of Bloodgood. Moist soil but good drainage. Outstanding, but not easy to grow. Frost sensitive in fall and spring. Acer palmatum 'Shigitatsu Sawa' The Gelderens' suggest a synonym for 'Reticulatum'. Although this plant has outstanding reticulated leaves, we believe it to be a different variety. Shigitatsu sawa grows slowly but robustly for us. Similar to Aka (red) Shigitatsu sawa, but without the red. Outstanding. Acer palmatum 'Winter Flame' Bright red bark in winter, somewhat darker red than 'Sango Kaku' and with more compact growth.